The Affiliate Gateway, a leading affiliate network, has launched its sleek new look today as it continues to expand globally. 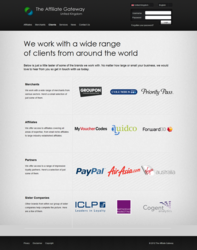 We are proud to be working with some of the top online brands. With its base in the UK and offices in Hong Kong, Singapore and Australia, The Affiliate Gateway is set to be a key player in affiliate marketing in new markets around the world. Its local knowledge and existing relationships with top merchants across the Asia Pacific area means it has already secured some of the best online brands as its partners. In Australia, Groupon, Betts Kids and Menu Log are just some of its merchants. While in Asia, Reebonz, the popular designer label discount store, and Showbiz Asia, Singapore's show and dining deals site, are a few of its top merchants. The Affiliate Gateway is also set to expand into Europe, Japan and the USA. It is already a key player in the UK market where travel brand leaders such as Priority Pass and Columbus Direct are amongst its merchants, and Quidco amongst its affiliates. The new branding demonstrates The Affiliate Gateway's core values of being savvy, effective, approachable and offering access to instant traffic in world markets. The Affiliate Gateway is an affiliate network that goes beyond the expected. Whilst we believe the underlying technology is important to the smooth running of our service, it is the combination of trust, communication and proven expertise of our team that makes us different. Our staff come from a range of backgrounds and industries but they all possess one thing in common - a passion for affiliate marketing. The Affiliate Gateway is part of The Collinson Group.